Published by Skira, edited by Renata Wirz and Federico Sardella with texts by Bruno Corà and Marco Meneguzzo, 2012 saw the publication of the Catalogue Raisonné of the works on canvas by Enrico Castellani comprising 1103 pieces created between 1955 and 2005. To purchase the publication please either directly contact the Enrico Castellani Foundation by sending an e-mail to info@fondazioneenricocastellani.it alternatively contact the publisher on the website www.skira.net or sending an e-mail to staff@skira.net. The Catalogue Raisonné treating the works on canvas by Enrico Castellani is to date the most important monograph dedicated to the artist’s work. Published in two volumes and edited in its entirety by Renata Wirz and Federico Sardella, it proposes to offer a new account regarding the first fifty years of the work by one of the major protagonists of the world art scene during the postwar period. 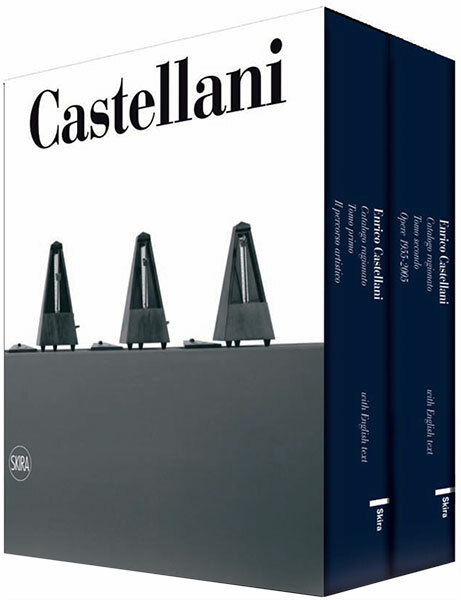 The first volume takes the form of an extensive and complete monograph that comprises more than one hundred and fifty colour photographs of the works created by Enrico Castellani covering the years 1958-2012, many of which published here for the first time. The initial paintings, his first relief surface and some of those that followed, the diptychs and triptychs, the baldachins, the angular pieces, the atypical works, the environments and the installations: a selection of images that will permit entering the artist’s creative universe whose coherence which is free from fashions has always been the procedural force which is as up-to-date as it is timeless. Introduced by a long essay on the part of Bruno Corà (analysing the totality of Enrico Castellani’s creative career without, however, foregoing the revelation of some of the most intimate and seductive aspects that characterise it) and an essay by Marco Meneguzzo (which tends to evaluate the reason why the artist’s work is fundamental and competitive on an international level). The first volume also contains the principal writings by Enrico Castellani and a selection of photos which constitute a sort of unusual and hitherto unpublished biography by way of images. The second volume that follows a chronological order is the Catalogue Raisonné of his production and covers the first five decades of the artist’s work which in being involved in person in this fundamental recognition examines all of the published documents and images. Overall, the Catalogue Raisonné comprises 1103 works carried out between 1955 and 2005 organised on the basis of an accurate selection and accompanied by precise files which offer an updated bibliographical and exhibition analysis. The Enrico Castellani Foundation is now gathering the material for the publication of the Catalogue Raisonné treating the works on paper, the graphic works and his production of multiples.